Click here for an article about BIRD BRAINS! Please go through different sites. Read, take notes and then, based on what you find out, pick one you would most want to focus on: Also, based on our work on the economy, I think it would be good to look at a type of environment or product that is being made that takes away resources. A-Z List of Endangered Animals - has clear lists of what is extinct, critically endangered, endangered, etc. ONE SPECIES AT A TIME- cool, interesting and educational site about animals and our earth. Light - Shadow and the Solar Eclipse! 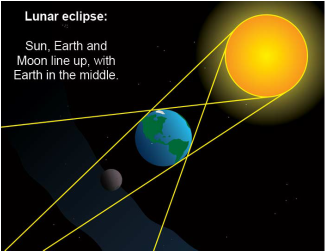 A pretty clear explanation of the difference between the lunar and solar eclipse! As we review science topics for the SCIENCE MCAS test, I am putting up good (and fun) sites to learn different types of science information. More coming soon. As we enter the last lap of the year, I wanted to add some sites that I think you would find interesting. Where should the $ go? Now that we raised money to protect the oceans, where should we donate it? Please review the list of places below and think about which one(s) we might choose. OPTICS and LIGHT! Optics is the science of light. More specifically, optics is a branch of physics describing how light behaves and interacts with matter. - Optics- Short Ted-Ed about why we see color! - HOW DOES LIGHT BEHAVE? - You might like this site too. - Visible Light Spectrum- Good site from NASA - Click Here - more complicated, but interesting. Educational Portal Series: For older students, but clearly explains some concepts we're studying. For each section there is a little video, a summary and a quiz.. Try them and let me know what you think. Astronomy - Earth, Sun and Moon. On the Fall equinox we went out and measured our shadows. We are doing the same thing on the Winter Solstice. Here are two videos that explain the reasons for the seasons. Here is another little video that explains it. On Friday, March 20, 2015 it was not only the Vernal Equinox, and a full moon, there was a solar eclipse. Want to know more about an eclipse. Below are some videos and explanations. Colorado Kids Push for Zero Waste Schools- Does this inspire you? Sylvia Earle, who came to Driscoll to talk about her exploration of the ocean, has a new movie out. It looks extraordinary. Click Here for more information. I (Ms. S) have not seen it yet. What can they teach us? How can we help them? Possible Organizations we might focus on as we think about what we can do to help animals and our earth. As we review science topics for the SCIENCE MCAS test, I am putting up good (and fun) sites to learn different types of science information.